Could it be time for a Longview HVAC replacement? When you’re faced with an emergency service, it’s not always easy to tell if you need a repair or replacement. Clients generally prefer repairs because it means less out-of-pocket costs and a smaller job. However, if your HVAC system is no longer working properly and leaving you with an uncomfortable home, a replacement is welcome. It may be a bigger investment than a Longview HVAC unit repair, but you’ll end up saving money in the long run. Your system will run more efficiently, lowering your utility bills and footprint. Trained, certified HVAC contractors in Longview TX from A/C Contractors will determine if your system needs to be repaired or replaced. Here are the factors that help us make this call. Air conditioners and furnaces have a lifespan of around 10 to 12 years and 15 to 20 years, respectively. Of course, things can happen much earlier than this. Our Longview HVAC contractors will try to repair a younger system and recommend replacing an older one. Old technology. HVAC equipment is always improving. With the latest technology, you can enjoy a more efficient, comfortable home and lowered utility bills. Cost of repairs. How many times a year are calling for Longview HVAC unit repair? If it’s often, you can save time and money with a new system. Credits and rebates. 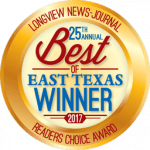 To lower the cost of a Longview HVAC replacement, there are tax credits and utility rebates you may be eligible for. When considering an HVAC replacement in Longview TX, our contractors will look at the performance of your current unit. Does the air feel stuffy or damp? Are the rooms consistent in temperature? If not, it may be time for a new system. With free estimates and second opinions for Longview HVAC replacement and repair services, it doesn’t hurt to give A/C Contractors a call today!